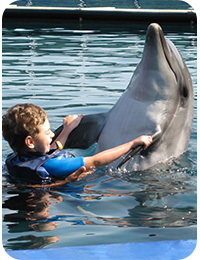 Swimming with Dolphins for everyone and Anti-Stres-Therapy are apart in separate pools. 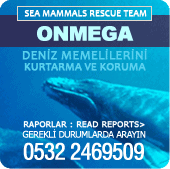 In the separate Dolphin-Therapie-Pool we have three special traineed Dolphins for the therapy. They are only available for the therapy of our patients. Europe’s first and only floating Sea Dolphinarium. 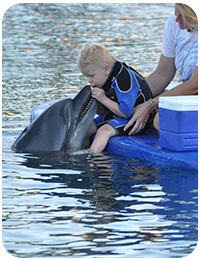 It holds our dolphins in their natural element and enables full benefit of their sonic waves.